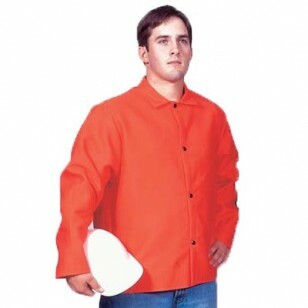 This flame resistant jacket is made of 9oz. Indura Proban Material. 100% Cotton, containing flame resistant properties guaranteed for the life of the garment if proper laundering instructions are followed. In INDURA engineered fabrics, the flame retardant chemical impregnated in the core of the cotton fiber acts as a catalyst promoting the charring of the fabric. This accelerated charring prohibits the support of combustion by reducing the fuel source thus giving the wearer added protection and time to escape the hazardous situation.